Organizes Desks and Media Centers: A simple and elegant way to create a well-organized desk or media center, this all-natural bamboo desktop stand with drawer raises computer monitors and laptops to a more ergonomic eye level and includes a pull-out drawer to hold remote controls or office supplies as well as a spacious bottom cubby to hide cords, keyboards, tablets and laptops. 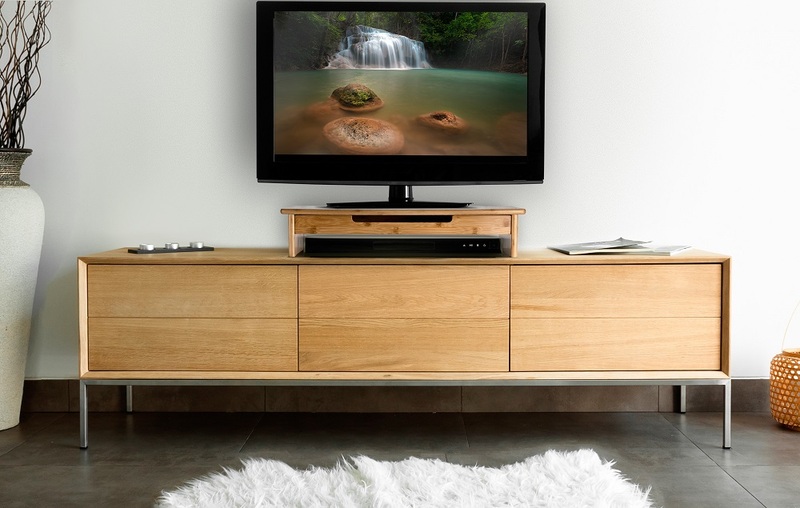 Raises Monitors: Just the right size with a low profile that's perfect for home offices, dorms, kitchens or bedrooms, raises monitors and laptops to eye level so you can work with less slouching and doubles as a media center for flat screen TVs with a bottom cubby to store DVD players, game consoles, cable boxes and more. Made of Eco-Friendly Bamboo: An eco-friendly monitor/TV stand made of naturally beautiful bamboo and certified by the FSC(R) (Forest Stewardship Council) as 100% natural bamboo harvested according to forestry standards from sustainably and responsibly managed plantations that support healthy ecosystems. 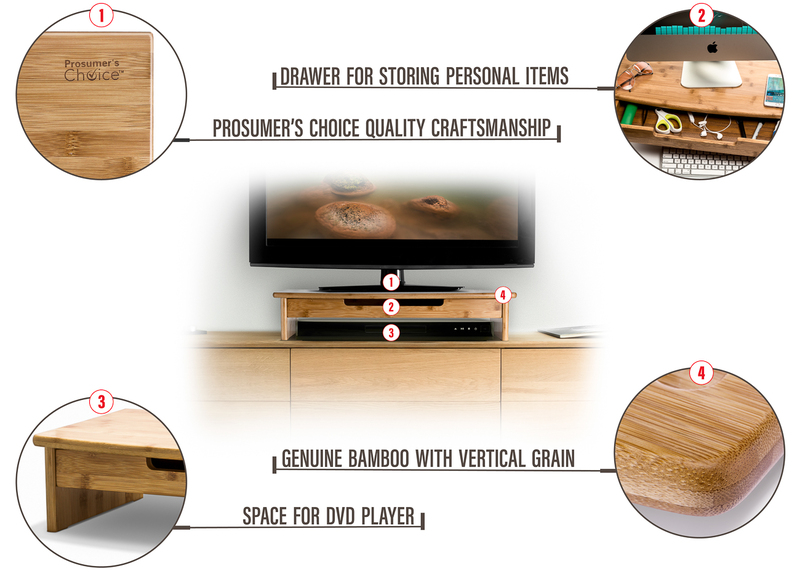 Sturdy Build Quality: Designed to conserve as much space as possible while reducing clutter, bamboo is more resistant to damage than traditional pressed wood stands and supports even heavy TV monitors while the solid build quality ensures that the stand stays in place while opening and closing the drawer. 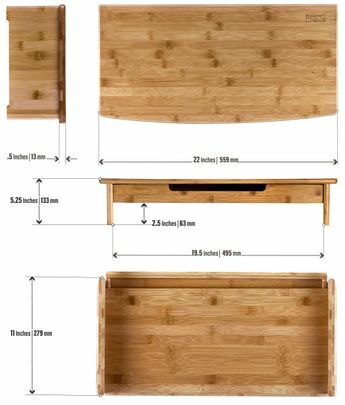 Extra Storage Space: No assembly required and ready to use right out of the box, a functional monitor riser that includes a pull-out drawer to hold remotes, phones, keys, pens, office supplies and other items that are easily lost or clutter-up spaces as well as a large cubby area for hiding keyboards, DVD players, game consoles, and tablets. The Prosumer's Choice Natural Bamboo Monitor Stand/Riser with Pull-out Drawer and Hideaway Cubby can turn a messy and cluttered desk into a well-organized work station or transform your game room or media center into command central. 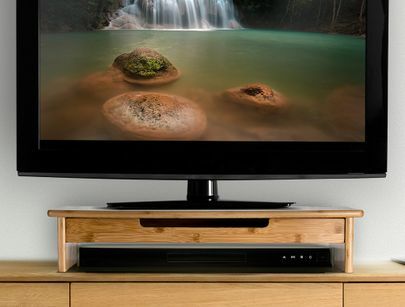 A better and sturdier alternative to typical painted wood stands that eventually become eyesores, this monitor riser is made of eco-friendly bamboo that is certified by the Forest Stewardship Council (FSC®) as 100% natural bamboo harvested according to forestry standards from sustainably and responsibly managed plantations that support healthy eco systems. Functional with a beautiful wood grain finish that adds elegance to drabby desks, credenzas or kitchen counter spaces, This Prosumer's Choice laptop stand includes a roomy pull-out drawer to store pens, batteries, remote controls, sticky notes, user manuals and other items that seem to disappear just when you need them most. No assembly required and ready to go right of the box, the bamboo stand holds laptops, computer screens and flat screen TVs and raises monitors and laptops to eye level so you can enjoy a more ergonomic work environment. Designed with a small footprint and low profile that maximizes work spaces, the bamboo stand also includes a hide-away cubby that conceals cords or can be used to tuck away keyboards, laptops and tablets.